At Foodjob Nordic we know that it can be a hard decision to start the search for a new job or submit your CV to a recruitment company with a range of personal information about your education, professional experience and other skills. This is an important interaction based on trust. 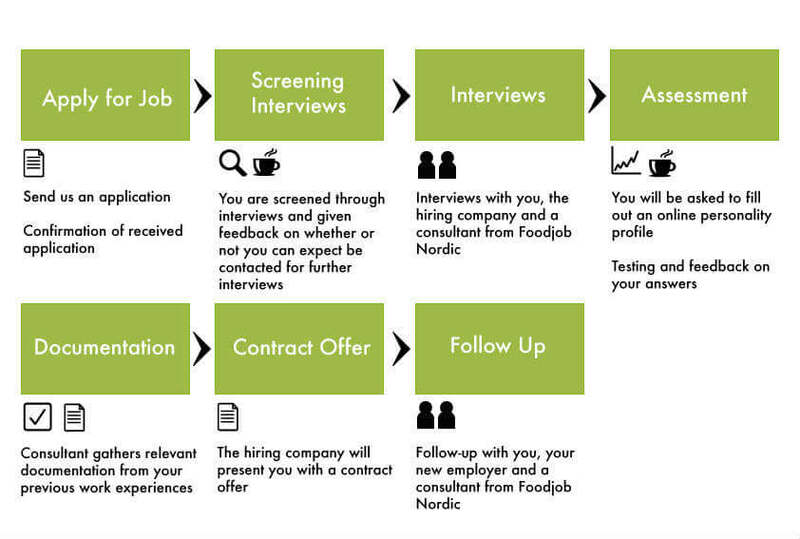 Therefore, Foodjob Nordic always make sure that the information we receive from candidates will be treated confidentially and used only for the purposes described below. When applying for a job or submitting your CV with us, we find it very important that every step in processing your data is handled in the most considerate way according to the protection of your data. Consequently, we have made a transparent flow chart of our entire recruitment process from submitting your CV to signing the contract with the company and even a follow up, months after being hired. Here on our website, you will find all our vacancies within the food industry. If you are interested in one of our vacancies, you apply directly through our recruitment system by clicking on the apply-button. Here you can attach your documents and fill in the needed information. Your application and CV are read by the assigned consultant from Foodjob Nordic, who will afterwards assess your relevance according to the job. As a part of the selection process you will be contacted directly and asked for further information, if the consultant finds you relevant for the job. The candidates who have the highest relevance for the position will be called in for the first personal interview, which will be held with the responsible consultant from Foodjob Nordic and the hiring company. Next, you will be asked to carry out a personality profile and perhaps other psychometric tests. You will get feedback from the consultant regarding the results. We always ask you for references in our recruitment process. If we choose to contact the references, you will be notified. Next step is the interview with the hiring company and hereafter the hiring conversation will be held where the contract will be signed. After being hired we always do a follow-up with the company and you as a candidate to ensure the best collaboration for the future. The follow-up will be approx. 3, 6 and 9 months after you have been hired. If you have questions about the recruitment process please find contact information on “Our Team”-page.